Romhacking.net - Review - A nice change up. 1. Adjusted color to make characters look more smooth. 2. All playable characters can run. Their weapon is shown while running. 3. Fixed the voice of Axel with his uppercut. 4. A new and complete set of weapon attack moves. 5. Max has different front throw and back throw. 6. All playable characters have new super moves, while some less functional old moves were removed. 7. Blaze now wears her BK3 outfit. 8. 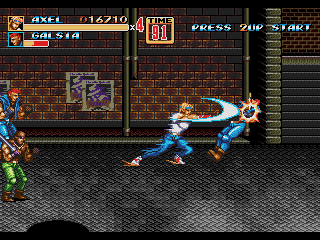 Some shadows were removed to reduce the size of the hacked ROM. (1) Special effect for weapon attacks. (2) B+C can attack enemies at both sides. 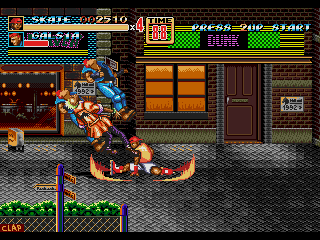 (3) The original back throw is replaced by pile driver. (4) Forward A becomes a combo. (5) The speed is slightly increased. 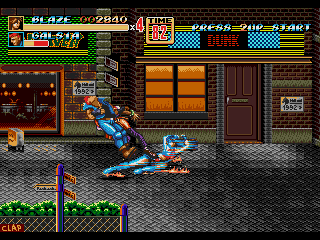 (1) F, F, B (blitz) becomes a “Shoryuken” style uppercut. It’s invulnerable while rising but vulnerable while falling. (2) B+C becomes Grands Upper (Bare Knuckle). (3) Static jump attack becomes a “Tatsumaki Senpuu Kyaku” style tornado kick. (4) Grab forward attack becomes a combo. (5) Forward A becomes an alternative Dragon Punch. It can attack enemies at both sides, but vulnerable to jump kicks. (6) Pipe attack now has BK3 style. (7) Sword attack now has BK3 style. (1) Jump kick has the same move as BK3. (2) Larger attack area for the blitz (F, F, B). (3) B+C becomes Kikoshou (Soul Fire). (4) Forward A becomes slide kick (as in BK3). (5) Knife attack now has BK3 style. (6) Pipe attack and sword attack now have BK3 style. (1) F, F, B is now a brand new move originally designed by the author Huo Yan. 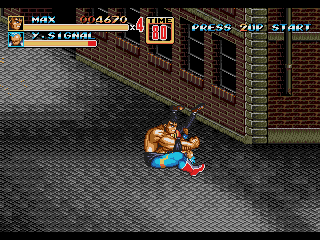 (2) Jump down attack now becomes a spinning kick. With perfect timing, it may generate an infinite combo. (3) Pipe attack now has BK3 style. (4) Forward A has a slightly larger range, and has lightning effect. (5) B+C can attack enemies at both sides. 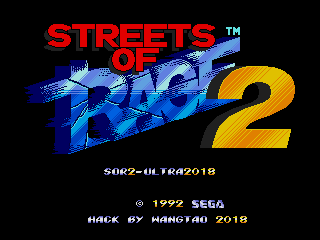 SOR2 Ultra 2018 adds a good range of moves to the existing cast, swaps in Blaze from SOR3, and add the ability to run. I am happy to report that the changes add quite a lot of fun without being too over powered. Thus far the only glitch I’ve encountered is that a few frames of animation for blaze being thrown are corrupted or garbled.